We were on the set for the filming of the Quickfire challenge onboard the ship! Although the filming took several hours, we got less than 1 second of screen time. But here we are! Brian and I happened to be in a pretty good spot as the camera flashes past us several times. The ladies we were talking to turned out to be from Wisconsin, in fact from right by our cabin! The two in the print shirts actually got an additional 2 seconds of screen time along with their comments on the food. Jane, Brian, and I all made it on again towards the end of the challenge. Sadly there is no sign of Holly. 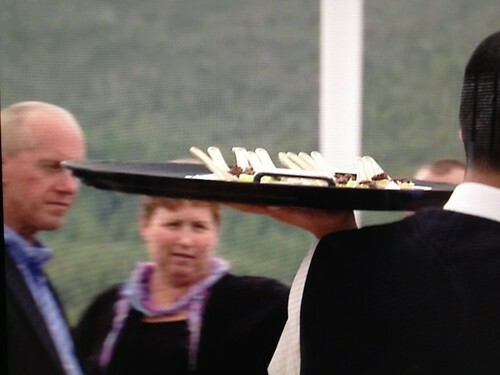 Of course since this was all way before the show started we had no idea who any of the chefs really were. I do remember really liking Sheldon's lettuce cups as well as Stefan's little potato soup cup. 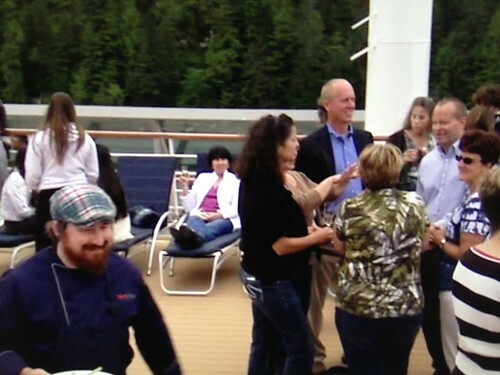 I could swear that I remember seeing Kristin on the ship, so maybe she got to come along since she would be competing in last chance kitchen in Juneau. Right now I'm looking forward to the finale. I'm not sure who I want to win the most, with Stefan and Josie gone all the villains are off the show. I think it would be awesome if Kristin makes it through LCK and gets to compete against Sheldon or Josh in the Finale. Thats Josh, by the way, in the first photo.